I'm not one driven by patriotism. Nationalities, certainly in F1, mean very little to me. But even I fully appreciate that there's something very special about the British Grand Prix. The Grand Prix at Silverstone very much feels like F1's home gig, and feels that way for a number of reasons. This is of course in part because eight of the 12 competing teams are based close by, as are a myriad of companies that supply them, in F1's answer to silicon valley. It's also in part because it was in Britain, and indeed at Silverstone, that it all started for F1 back in 1950. And the airfield track, despite inevitable changes in the meantime, retains much of its old character. 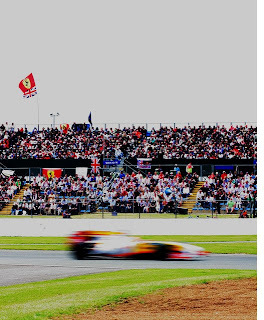 But it's also because very few races can match the British Grand Prix for the number, enthusiasm and knowledge of those who fill the grandstands. Many are there primarily to support the British drivers of course, but many are not and a worthy winner is always applauded at Silverstone whoever it is (despite the odd aberration such as in 1992). 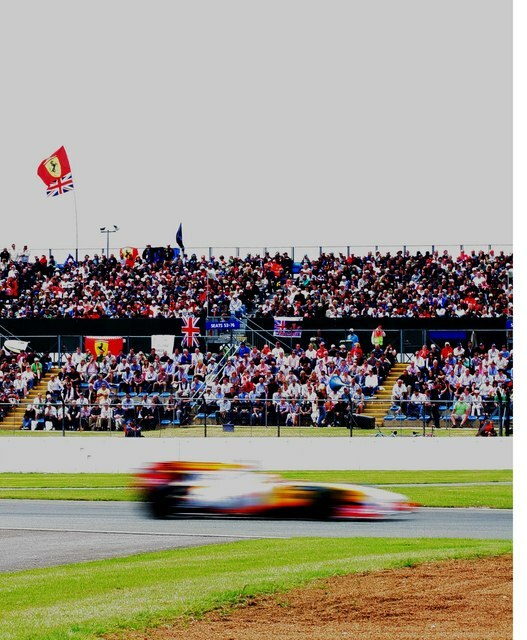 In an age wherein such core support has had its back turned on it by the modern F1 itinerary, to be replaced by more and more by rounds that owe more to the host Government's desire to 'brand' the country and boost its tourism rather than to local motorsport passion, Silverstone's place is especially welcome. Eddie Cheever, in the dark but recent days when the race looked to be under threat, summed it up: 'not having a British Grand Prix is like the Pope not going to the Vatican'. 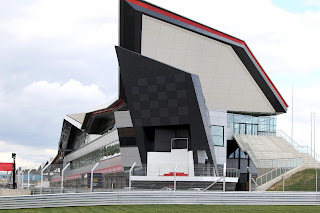 Thankfully the absurd threat to the race's future has receded, the contract to keep the race at Silverstone all the way to 2027 is in place, and in the past couple of years the venue has undergone its most extensive revision since its early days. A large track detour has been added: turning Abbey into a fast right-left sweep, adding a slow technical right-left at the arena section, then bringing the old 'club circuit' straight into use. And last year the start line was moved to between Club and Abbey, in deference to the new 'wing' pit and paddock complex there. While the move gave the track a strange, out of context feel, it also meant that no longer can Bernie claim that Silverstone is the sport's straggler facility. Another way in which visits to Silverstone are welcome is that it is one of the few circuits with a preponderance of long, fast corners. And this weekend rain is expected, possibly on all three days, with temperatures likely to be cool. So what does it all mean for the protagonists' chances? For much of the season the McLarens have been the most effective in quick corners, seen in their speed in the fast stuff in Malaysia as well as in Barcelona where, lest we forget, Lewis Hamilton qualified half a second under the best anyone else could muster. So Silverstone should be right up their street. Of course, both drivers are in their home event and will be suitably pumped (though Silverstone, strangely, has rarely been kind to Jenson Button). And on top of everything the team is bringing an upgrade with it this weekend which Sam Michael reckons will be worth a tenth of a second per lap or more. However, a possible flipside is that the McLarens have tended not to be at their sharpest this year when the ambient gets a bit cool and damp, so the typical English summer elements may not work in their favour this time. Then there are the Red Bulls. Sebastian Vettel routed the field in the last round in Valencia before retiring, and Mark Webber came from the back to finish fourth. This has led some to believe, including Ferrari, that the Bulls may well have made a distinct stride on the rest of the field. Of course false dawns have been numerous in ever-unpredictable 2012 but Silverstone, a very distinct challenge to Valencia, should give us a clearer idea of whether Newey and co. have indeed had a eureka moment. And what about Ferrari? Well, as said by Mark Webber: 'as long as Fernando (Alonso) has a steering wheel in his hand he is always there. You can never discount Fernando.' And especially so if there is rain around and drivers are required to live on their wits (as evidenced by his win in the wet in Malaysia earlier this year). And while the F2012 had a difficult infancy, even then it was thought to be strong in fast corners. So long as the recent improvements haven't come at the detriment of this Ferrari will not be far away at Silverstone. As for dark horses, perhaps dark only literally rather than metaphorically we have the black and gold Lotuses, in the sense that the car could be up there as of rights rather than a surprise package. The E20 is another car strong in fast corners - taking the year as a whole possibly only the McLaren has been stronger here. And few cars are as adept as the Lotus in keeping its tyres together in a race stint, and tyre wear rates tend to be high at Silverstone because of fast corners such as Copse and Stowe and a track surface not big on grip. As usual given the Lotus isn't quite as sharp in qualifying as in a race invariably, a lot will depend on how much Romain Grosjean and Kimi Raikkonen have to do from their grid slots. This is especially so given that the one criticism you could make of Silverstone's layout is that it doesn't have glaring places to overtake, and further the DRS zone isn't especially generous. Nevertheless, we've been waiting a long time for a Lotus victory; there are lots of reasons to think we'll see it on Sunday. A team who could be more of a classic dark horse is Williams. The FW34 produces lots of downforce which will serve it well through Silverstone's sweeps, and it's also been a good performer this year on a cool track, such as on Malaysia race day and in Barcelona qualifying. Plus the tyre compounds being brought by Pirelli to Silverstone match those brought to Barcelona, and from what I recall the team didn't do badly there. Watch out for Pastor Maldonado this weekend - for the right reasons. And 'Williams win at Silverstone' has a lovely familiar ring to it. So, we have a number of credible contenders, variable weather to throw spanners into many people's works, and given that this is 2012 the competitive order should be close. There are even more reasons than usual to look forward to this British Grand Prix meeting.